How cute are these holiday cookies? And, they're just as fun to make, too! The kid's will have fun helping roll the dough into ropes to create the wreath shape. Preheat oven to 350°F (175°C). Combine 3 cups flour, salt, and nutmeg; set aside. Cream butter and sugar until fluffy. With mixer on low, add egg, eggnog, vanilla and rum extract, scraping down sides until well blended. Gradually add flour mixture to make dough. Divide mixture in half. Dust work surface with flour. Place half of dough on surface, make a well in center and add red food coloring paste. Knead color through dough until even, dusting surface with flour as needed. Roll into a 12-inch log, wrap in plastic wrap or waxed paper and refrigerate at least 30 minutes. Repeat with remaining dough and green coloring paste. Cut each log into 24 pieces. On a floured work surface roll each portion into a 6 to 8-inch long rope. Place a red and green rope side-by-side. Twist one rope over the other, gently pressing the ends together into a wreath shape. Repeat with remaining red and green ropes. Place on parchment-lined or ungreased cookie sheets about 2 inches apart. 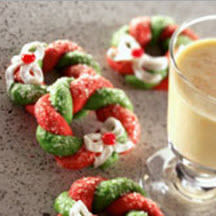 Brush wreaths with egg white and sprinkle with sugar, if desired. Bake for 10 to 12 minutes. Cool on cookie sheets; remove to wire rack to cool completely. Using a decorator tip, pipe frosting into bows on wreaths and add a cinnamon candy, if desired. Makes about 3 1/2 to 4 dozen. *Traditional liquid food colors may be used, however they will require a larger amount to achieve the same vibrant colors.